On May 12th 1820 Florence Nightingale, whom we consider the founder of modern nursing, was born. Since 1965, the International Council of Nurses has celebrated International Nurses Day on May 12th in her honor. This was my first May 12th in the field. This was also going to be the last International Nurses' Day at CRUO. This was going to have to be a very special occasion for the over 100 nurses and auxiliary nurses at CRUO. The 2018 MSF theme was “nurses without borders”. With that in mind, we organized a committee, which included a Haitian and an international supervisor from each service. 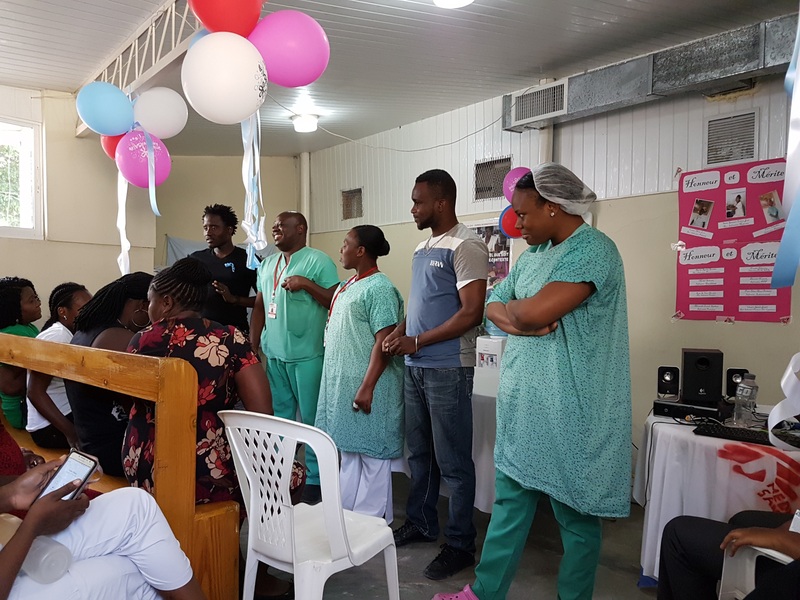 Open to suggestions and ideas, the international pediatric nurse supervisor shared that she and the two Haitian supervisors were thinking about honoring one or two nurses of the department for the occasion. I immediately thought this was an amazing idea and why can’t we make this a hospital-wide initiative. We asked each department to vote for whom they thought were exemplary nurses. Who, on a daily basis, on their team demonstrates the qualities that Florence Nightingale displayed and embodied. Voting boxes were distributed in each department and the rules were simple: 1. Vote for a team member who you believe goes above and beyond and exemplifies the ideals of nursing. 2. You must include a justification for why you nominated this individual. Preparation in the neonatal office. As the day approached we had another committee meeting. Each national staff supervisor was nominated for different tasks and presentations on the day of. Each assignment matched their personalities to a tee! We would have an education session for the patients and their visiting families on the role and responsibilities of a nurse on the morning of. For the afternoon staff party, we would have a few presentations. The post-partum international supervisor found a great story about Mrs. Marie-Claire Heureuse Bonheur, who could be hailed as the first nurse of Haiti by providing medical care and food aid to the victims of the war of independence of Haiti in 1800. We all agreed sharing this story would be a great addition to the festivities. We had a little debate over how much food and how many cakes we should order, we settled on 2 large, I for one thought it may be too much… I would later learn I was WAY wrong! Before the big day, the ballots were counted and we had 11 exemplary nurses and auxiliary nurses to honor. We tried to take pictures of each person to put on a poster for the reveal at the party. Unfortunately, without telling them what it was for, most didn’t want their picture taken! Hmmmm… a difficult obstacle to overcome. So we tried our best, and got a few group pictures, and a few of people ‘in action’. The certificates were printed, signed and stamped, ready to be handed out. Since May 12th fell on a Saturday we were celebrating on the Friday. Well, that day started off with some last-minute run arounds. It wouldn’t be a real party if there weren’t a few last minute dashes to the finish line! You were barely able to walk into the neonatal department’s office at noon as there were balloons all over the place, there were 2-3 people on their hands and knees adding sparkles to posters and some in the corner making badges out of blue and white ribbons for each nurse to wear with pride at the party. Don’t worry… the babies were still being watched over! At 15h30 people started to pile into the meeting room. 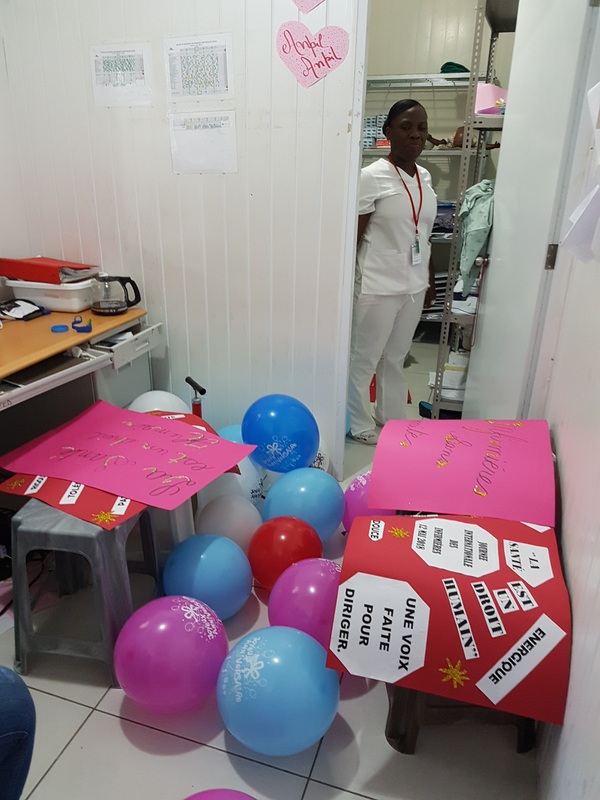 All the posters were hung with care, balloons and ribbons dangled from the ceiling, music was playing and each nurse or auxiliary nurse who walked in was immediately handed a pin and hand-made ribbon to signify it was their special day. The celebrations opened with the nurse’s poem, read aloud by the national post-partum nurse supervisor. Followed by a joint presentation on the deontology of nurses by our bed manager and the assistant nursing director. Music was quickly played when there was more than 3 seconds delay, our DJ was on point! (Pictured, from left to right) the new CRUO President, Minister of Economy, Prime Minister, Health Minister and Bouba. Keeping with the theme of “nurses without borders” each international nurse made a slide with some photos from nursing in their home countries. I spoke a few minutes about my work in Northern Quebec with the Inuit population, our infection control manager spoke about his work on an air ambulance team in Senegal, our pediatric supervisor spoke about her work with neonates and mothers in Rwanda and finally our post-partum supervisor spoke about her work in intensive care in Brazil and her previous assignments with MSF. To close up the presentation we wanted to play the MSF video made to honor the occasion and the nurses working globally for MSF. In true fashion, at that moment in time, we had an Internet issue. So instead of the group staring at a bunch of bums trying to regain a connection, our infection control manager stood up and animated a social game. 4 volunteers didn’t know what they were in for! They were put on the spot to campaign for their presidency of Haiti. The population, the audience, would vote for their favorite candidate. Their were promises of free healthcare for all, free education, the typical political banter “how are we going to offer free healthcare!!?!?! We need to work on our economy!” and the final plea was to advocate to keep CRUO open. The population was inspired by all, chants were shouted and slogans born. By the end of the 15 minutes, the population had spoken and the competition was tough, CRUO had a new president, a new prime minister, a minister of health and a minister of economy. Then came the big moment, the reveal of the certificates of merit. The national staff supervisors were responsible to describe to the group why the team voted them in. They each did an amazing job! Their speeches gave me goose bumps. Each supervisor used words like dynamic, exemplary, organized, team player, hardworking, caring, empathetic, disciplined, flexible, heroic, available for the patients and so on. Most had stories to accompany their descriptions. It was clear to all of us that the individuals honored deserved these awards 110%. The honored who were in attendance were often speechless and overwhelmed by the recognition. 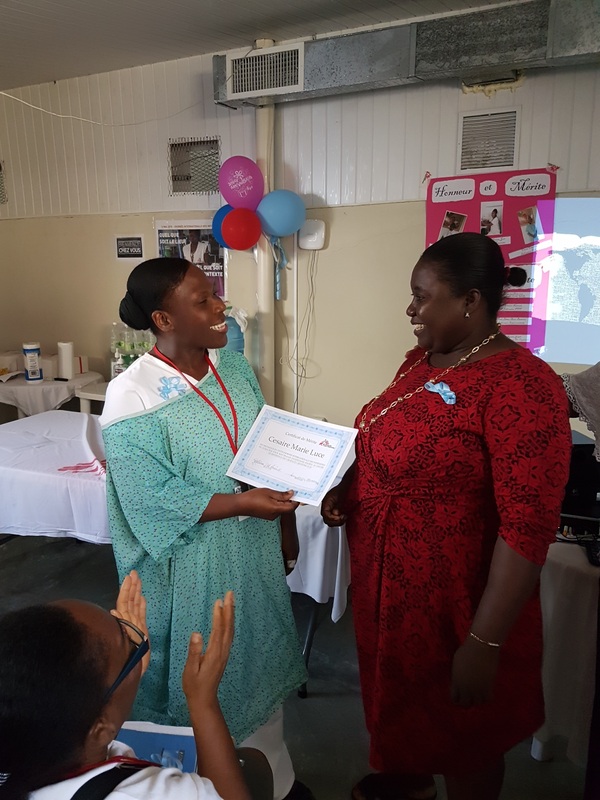 Nurse Ceasar (left),a neonatal auxiliary nurse, receives a certificate from her supervisor, Gina (right). 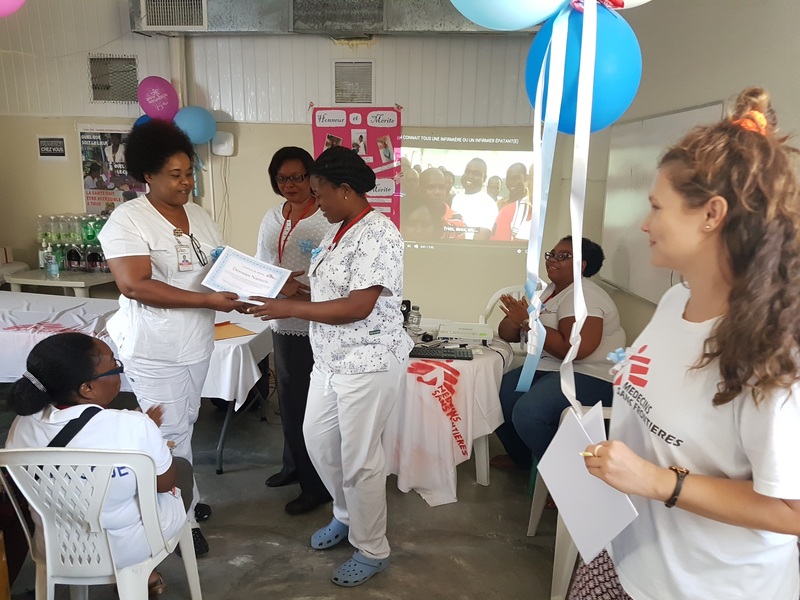 Nanncie (right), a post-partum nurse, receives a certificate from her supervisor, Linoche (left), and the assistant nursing director, Zulta. I am pictured in the foreground. At the end of the certificate distribution we were finally able to watch the MSF video, seeing nurses from across the globe smile with pride and say they were nurse without borders in their local languages. The cakes were cut. The line was almost out the door. This was when I realized “Yup… I’m glad I caved and listened, we really did need 2 cakes!” There was not a crumb left behind by the end of the line. The people in line were bobbing their heads and swaying their hips to the music. Some people partnered up and began dancing kompa, a Haitian national dance. The ambience was joyful and full of laughter. At the end of the day, I was exhausted but so proud to be apart of the CRUO team. On may 12th, along with over 8 843 nurses worldwide working for MSF, I was a nurse without borders! 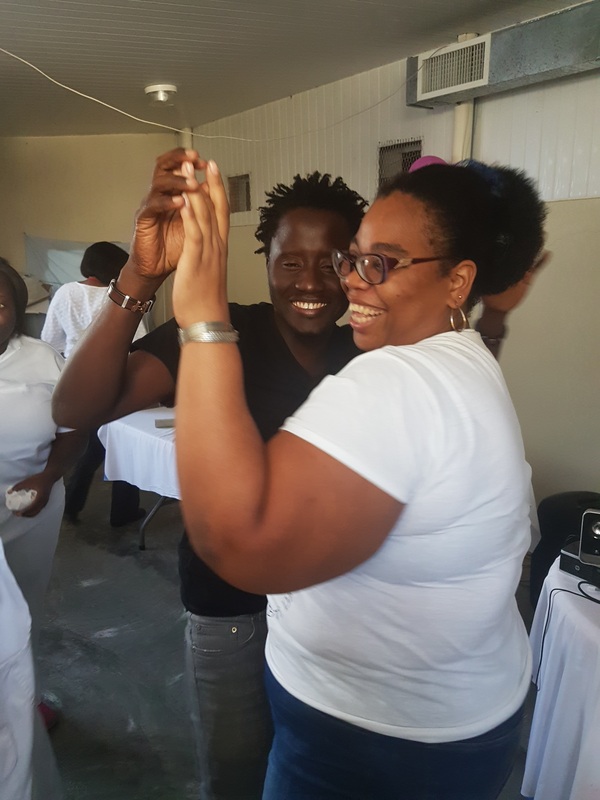 Two MSF staff members, Kimberley, bed manager and Bouba, control manager, dancing and enjoying the celebration.